observation: "Everybody dies...It's a thing I've noticed." All of which is to say that things sure could be worse. And along with that fact is the feeling, possibly inaccurate, that I've done a fair bit of writing on this blog lately, and so I don't feel terribly compelled to write anything of substance right now, as I didn't, you may have noticed, yesterday or the day before. But I'm cool with that, and I'm not usually. The difference today is that, unlike previous fallow periods, I feel pretty confident that the compulsion will return very shortly, like in say a day or two. In the meantime, I'm going to take a page from Glenn Kenny's book and post a picture of a meal I ate today, one my wife cooked and which we both thoroughly enjoyed. 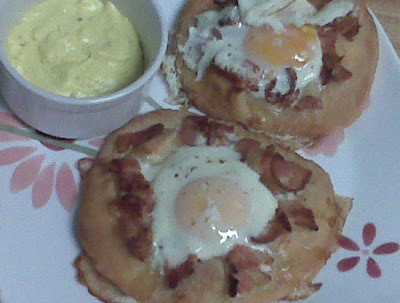 It's called "egg and bacon pizza", or something like that, but there's not much "pizza" going on here -- all it is, is somebody's brand new way to make eggs even better to eat. As if such a thing were possible! But it was good, as you can probably imagine, looking at that picture, and now I think that The Devil's Rain sounds like a capital idea. Hope everyone had a good weekend, and I will talk to you in a couple of days. It appears you like them over-easy, at least that's what it looks like. If so, may I give you a hearty slap on the back. Egg yolk is scrumdillyumcious! Egg yolk is the best thing in the world. When I was a kid, I thought eggs were gross, even though I never ate them. As a growed-up adult, I mourn the years of egg-yolk eating I lost to youthful ignorance. If I order eggs, and the yolk comes back hard, then sister, we've got a problem. I proudly taught our youngest, now 8, to love over-easy eggs. Every Saturday morning she has two with toast. Mmmmm-mmm, it's good! Wow, those look delicious. You wouldn't happen to have a link for the recipe, would you? Cap-Syool Reviews!! Enjoy Them Now!